Second chance at Leland's field of dreams. I met Leland Parsons in 2017, a rough-and-tumble man with a heart of gold [Leland has been in the pages of Latitude many times, most recently in the December issue's Sightings]. 20Second chance at Leland's field of dreams. I met Leland Parsons in 2017, a rough-and-tumble man with a heart of gold [Leland has been in the pages of Latitude many times, most recently in the December issue's Sightings]. In December 2018, kiter Alex Soto hit a shark in the Dominican Republic while ripping along on his foil board. The viral video said that Soto wrote in a Facebook post that, "Shark is alive." Soto said he saw the shark swim away and that he "didn't hit it in the head." But his foil was badly damaged. 46In December 2018, kiter Alex Soto hit a shark in the Dominican Republic while ripping along on his foil board. The viral video said that Soto wrote in a Facebook post that, "Shark is alive." Soto said he saw the shark swim away and that he "didn't hit it in the head." But his foil was badly damaged. Our 500th issue. When we started thinking about 500 issues of Latitude 38, the first thing that came to mind were the names. Peterson, Larson, Heineken, Tompkins, Mull, Holland, Baylis, Easom, McNeill, Cayard, Wondolleck, Prussia, Corlett, Livingston, Disney, Blackaller, Moore, Stapleton. Endless names of sailors who did things great and small, fun and curious. 48Our 500th issue. 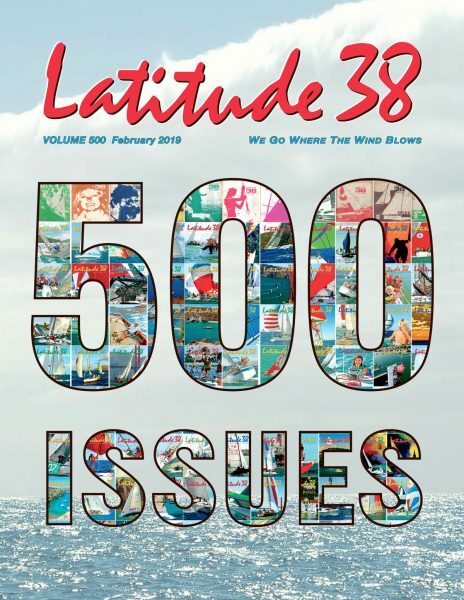 When we started thinking about 500 issues of Latitude 38, the first thing that came to mind were the names. Peterson, Larson, Heineken, Tompkins, Mull, Holland, Baylis, Easom, McNeill, Cayard, Wondolleck, Prussia, Corlett, Livingston, Disney, Blackaller, Moore, Stapleton. Endless names of sailors who did things great and small, fun and curious. The statue, bronze-cast and glowing brilliantly in the sun, has frozen in time a man, focused and intent, but undeniably stoked, at the helm of a catamaran, surfing down a wave. It is a real pleasure having a conversation with Taylor Canfield, who is arguably one of America's greatest sailing talents. Visit any cruiser haven around the world and you're likely to find plenty of sailing couples whose liveaboard lifestyle appears to be simple, idyllic and carefree. We had so many [profiles] — and we wanted to include as many of them as possible — that they trickled into a fourth issue. Thus you hold in your hands (or view on your screen) the final installment honoring class winners of the 2018 Bay Area sailing season. The Bay Area waterfront is ever- evolving. It is, at once, a remnant of the boom of recreational sailing, and a rapidly changing landscape being molded by the pressures of population. Blink and you'll miss them — but you'll sure hear them! Daniel Thielman's Melges 30 'Kuai' roars like a freight train to the finish of the Corinthian Midwinter race on blustery Sunday, January 20, just ahead of a rain squall. 88Blink and you'll miss them — but you'll sure hear them! Daniel Thielman's Melges 30 'Kuai' roars like a freight train to the finish of the Corinthian Midwinter race on blustery Sunday, January 20, just ahead of a rain squall. In these hectic times, many sailors find they just don't have the time to properly maintain a boat of their own ­— not to mention the cost of buying and berthing one. As a result, the international charter industry continues to flourish, and membership in local sailing clubs continues to rise. 96In these hectic times, many sailors find they just don't have the time to properly maintain a boat of their own ­— not to mention the cost of buying and berthing one. As a result, the international charter industry continues to flourish, and membership in local sailing clubs continues to rise. This month's Changes features Escapade's know-before-you-go report on cruising the Med; the truth about sailing in southern Mexico from Cinderella, and Where Are They Now? — a look at where some of the boats and folks featured in 2018 Changes are now. 100This month's Changes features Escapade's know-before-you-go report on cruising the Med; the truth about sailing in southern Mexico from Cinderella, and Where Are They Now? — a look at where some of the boats and folks featured in 2018 Changes are now.